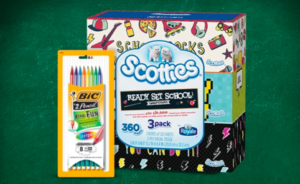 Now through September 6th, enter the Scotties Ready Set School Sweepstakes for a chance to win the grand prize of $10,000 cash or one of 24 first prizes of $500 cash each. Plus, there will be 1,400 second prize winners who will each receive a Back to School Prize Pack filled with a BIC backpack, 3-pack of Scotties Facial Tissues, 8-pack of pocket size Scotties Facial Tissues, BIC Xtra-Fun Stripes #2 Pencils, BIC Velocity Mechanical Pencils, BIC Atlantis Original Retractable Ball Pens, and BIC Gel-ocity Retractable Gel Pens ($42 value!). Enter once per person and per day for more chances to win. And after you enter the first time, you’ll have the option to share and print coupons valid for $1/3 boxes or $1/1 multipack of Scotties Facial Tissues or $1/1 BIC Xtra Fun Cased Pencil 8 count or larger.